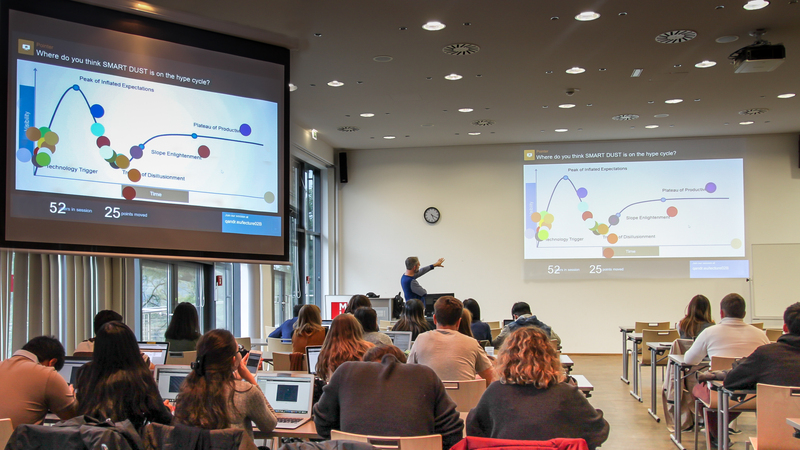 Noterik’s user engagement tool QANDR is being used successfully at the Modul University to innovate this semester’s Bachelor course on New Media and E-Business Applications. Every week, two MODUL assistant professors, Dr Lyndon Nixon and Dr Irem Önder, are using QANDR in parallel to engage two separate groups, with each around 60 students, in a playful manner, by querying them with polls on technology trends for business, asking them to position pointers on illustrations like the Gartner Hype Cycle, or collecting in real time student suggestions using an onscreen Word Cloud. The students make use of their mobile phones, tablets or laptops to be presented with calls for interaction and respond to them, with results shown real-time on the presentation screen.